I was having a friend over a couple weeks ago, somewhat unexpectedly, so I decided I needed a dessert to go with the big dinner I was cooking. Generally when I choose a dessert, it’s fruity or light, but knowing him, it HAD to be chocolate. Naturally, I browsed my Pinterest boards to see if a quick solution presented itself. 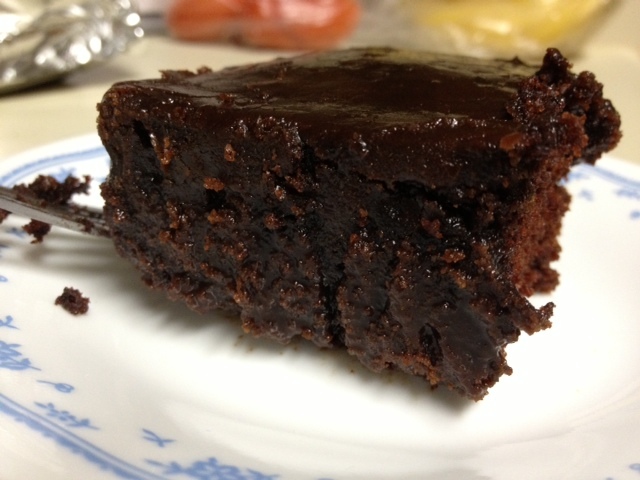 And I found this recipe, which billed itself as “the best chocolate cake”. Let’s put that to the test, shall we? Preheat oven to 350. There are two ways you can do the batter. You can actually mix it up in the pan, or just do it in a bowl like a normal person and then pour into the pan. I chose Door #2. 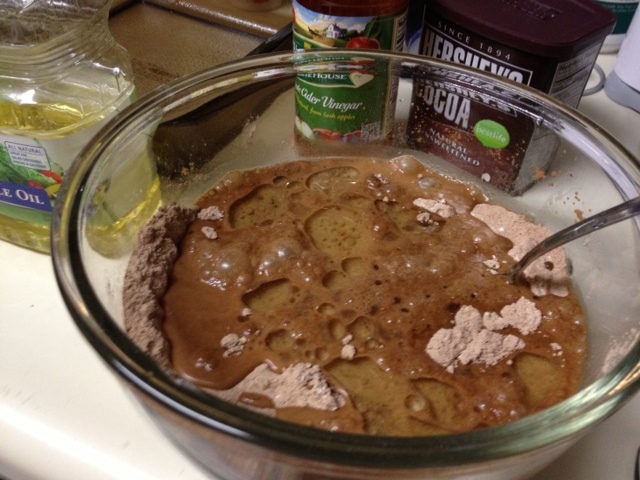 Mix the dry ingredients in a big bowl. Add the oil, vanilla, and vinegar, then stir. Don’t over-stir, just enough to get everything combined. 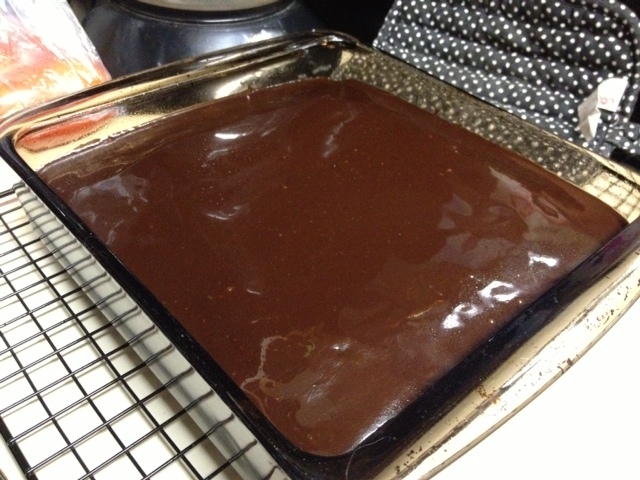 Spray a 9×9 pan with non-stick spray, then pour the batter into the pan, evening out the distribution. Bake for about 30 minutes, then set on a rack to cool completely (about two hours). When the cake is cooled, make the frosting. Heat the butter (or margarine), sugar, milk, and cocoa in a saucepan, bringing to a boil. Boil for 1-2 minutes, stirring frequently. Then lower heat to a simmer for another two minutes. Remove from heat for about five minutes, stirring occasionally. Add the vanilla, stir in, then immediately pour onto the cake. The frosting cools quickly, so spread out evenly as quickly as possible. Leave to cool for at least an hour (if you can wait that long!). 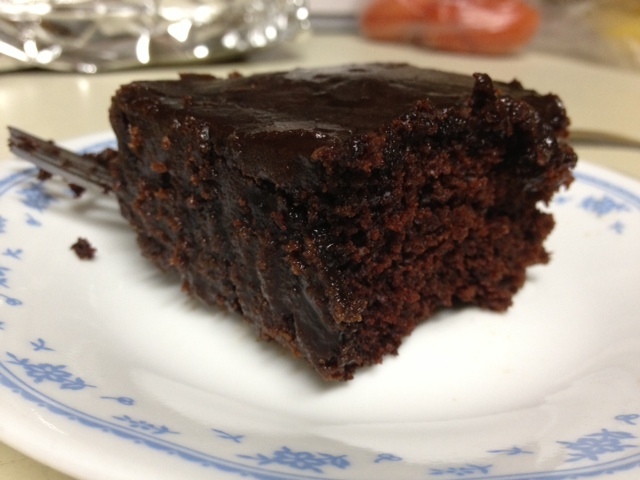 The cake was moist, fluffy, and not TOO sweet or rich (which I appreciated). 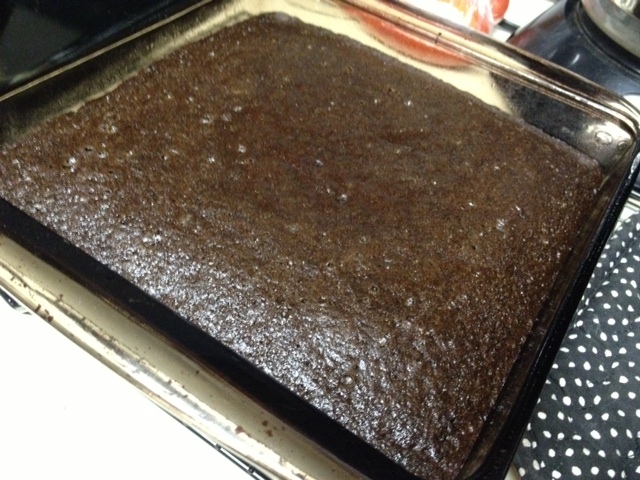 Many of my co-workers actually thought it was brownies, not cake, from how moist and gooey it looked in the pan. Overall it was an easy, great dessert option, and certain simpler than layer cakes! There are two ways you can do the batter. You can actually mix it up in the pan, or just do it in a bowl like a normal person and then pour into the pan. I chose Door #2. 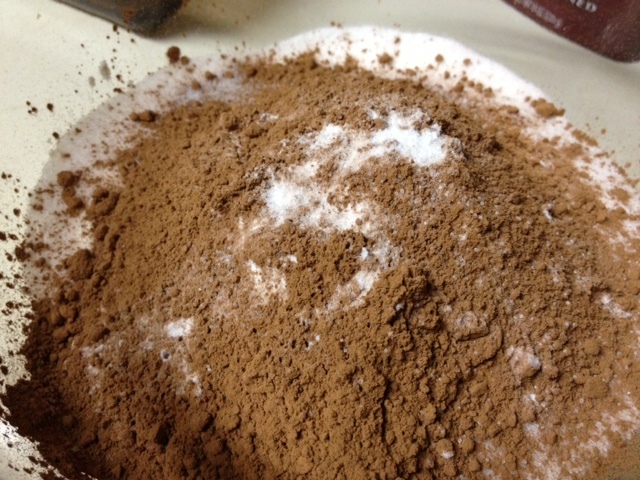 Mix together flour, sugar, cocoa, baking soda, and salt, making sure it is well blended. Add the water, vanilla, oil, and vinegar, and mix well (making sure to get any clumps out). 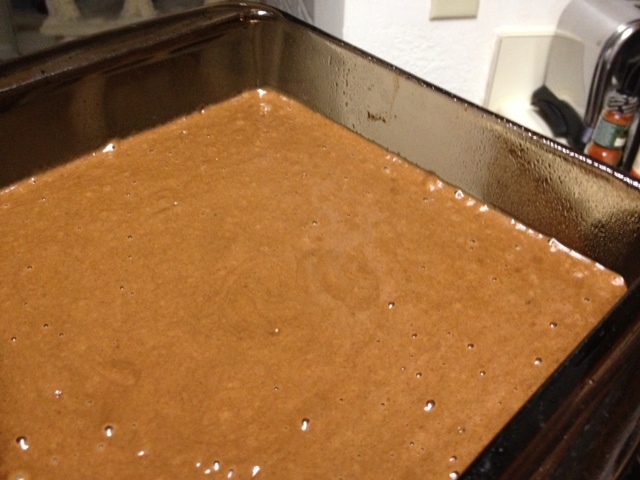 Pour into a greased 8×8 or 9×9 pan. Bake for about 30 minutes, or until a toothpick comes out clean. Cool on a rack completely (about 2 hours). 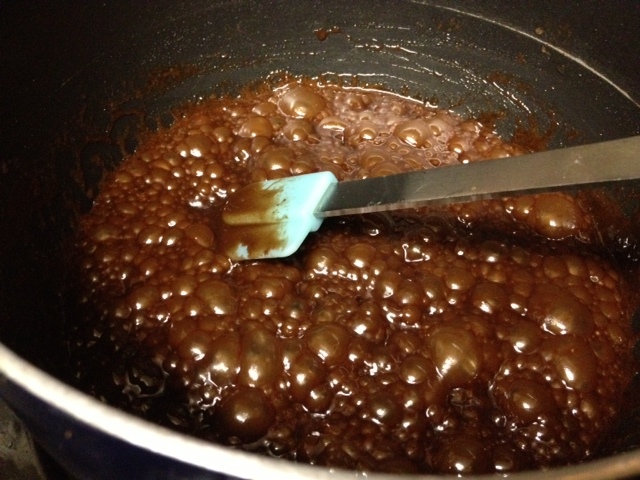 For the glaze/frosting, bring sugar, margarine/butter, milk, and cocoa to a boil in a small saucepan for 1-2 minutes. Stir frequently. Then reduce heat to a simmer for 2 minutes, stirring constantly. Remove from the heat and stir for another 5 minutes. Add the vanilla, stir, and immediately pour onto the cake. It will solidify really quickly, so spread it immediately and add any desired toppings right away. Let this cool for an hour (if you can! ).